Disposable Enema Bucket Set: 1500-cc bucket is graduated in both ounces and milliliters. Notched handle facilitates carrying the unit with tip in an upright position. Soft vinyl tube (54" long) has a pre lubricated non-traumatic tip with rounded eyes for safe, easy insertion. Positive-close clamp on tube is designed for one-handed operation. 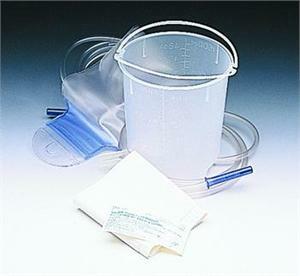 Set contains bucket, tube, plastic clamp, castile soap packet, and moisture-proof underpad. Each set is individually wrapped in a polypropylene bag.